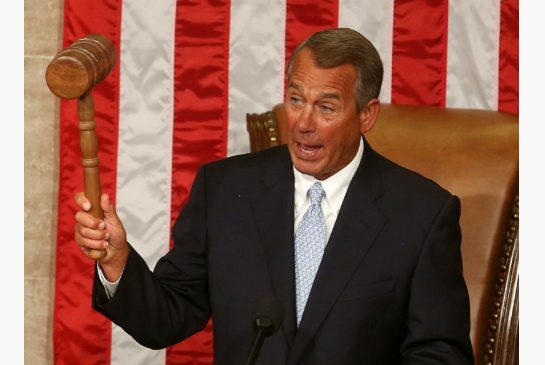 John Boehner, the speaker of the House of Representatives, will resign from Congress next month, he announced on Friday, in a stunning move that follows intense pressure from conservatives in the House. The top Republican on Capitol Hill announced his resignation at a party meeting on Friday morning and later confirmed in a statement that he will step down on 30 October. It brings to a close a career spanning nearly three decades, and a four-year speakership that has been marked by Republican infighting following the party’s taking control of the chamber in 2011. 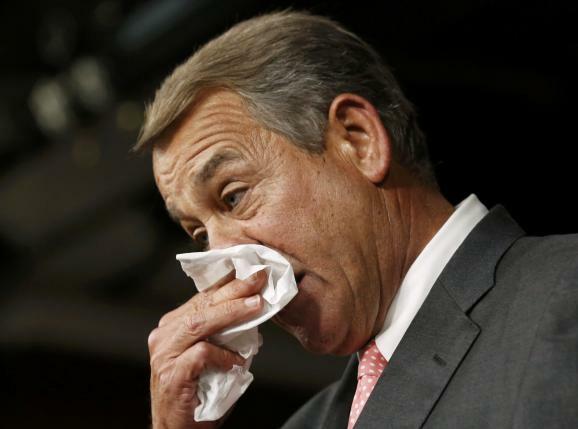 While addressing the media on Friday afternoon, a tearful Boehner cast his decision as one designed to protect the institution of Congress. Boehner, 65, has long been under intense pressure from House conservatives, who have repeatedly threatened to stage a coup against him and expressed dissatisfaction with his leadership in high-profile fights on Capitol Hill. Boehner has survived many rebellions from the hard-right wing of his party over the years, notably over bipartisan deals that raised taxes in 2012 and resolved a government shutdown in 2013. “Hold on. Hold up. Don’t your dare. Not on my stage. No, thank you. Let me say something. I am 71 years young. I am not Nicki Minaj or that little Miley (Cyrus).Oh, no! Get off of my god darn stage, b**ch! And stay off! Put him out of the building! Put him out. How dare you. 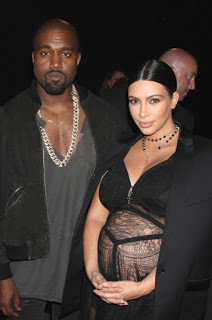 Super Star Kanye West and Kim Kardashian are one of the most powerful and talked about couples in the celebrity world over the years. 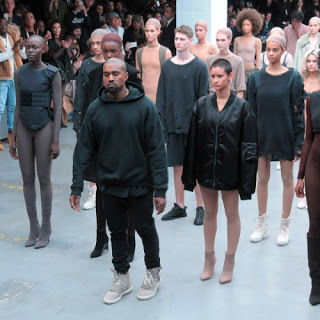 However, it seems even Yeezy has a limit to how many people he wants discussing his private life, and has slapped a ban on his New York Fashion Week models from talking about him and his wife- Kim. 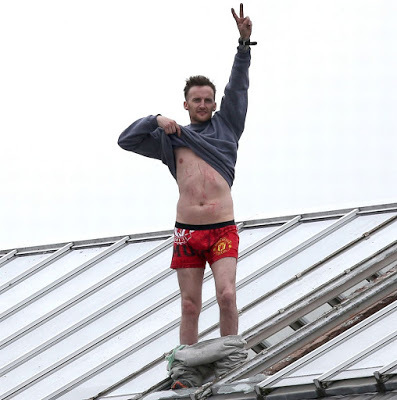 35-year-old convicted murderer Stuart Horner finally ended his Strangeways roof protest after more than 60 hours of negotiation. 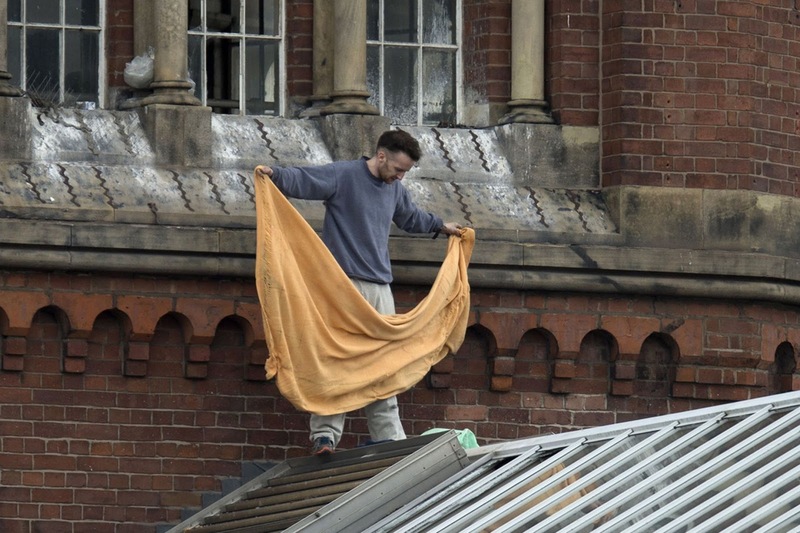 Horner first scaled the prison on Sunday at around 2pm, climbing a fence in an exercise yard and later onto the roof. In the early hours of Monday morning, he began tearing up the prison – smashing windows and and destroying the ground below. The murderer was in a tense stand-off with riot officers on Tuesday. Two officers with shields were seen making their way up a ladder in the roof space close to where the prisoner was holding his protest. As they made their way onto the roof Horner was seen walking towards them with a metal rod in each hand. The police advanced him after he had continued to cause damage to the building kicking off CCTV cameras and smashing windows. A ‘party protest’ began outside on Monday evening, as crowds gathered to show their support for the convicted killer. 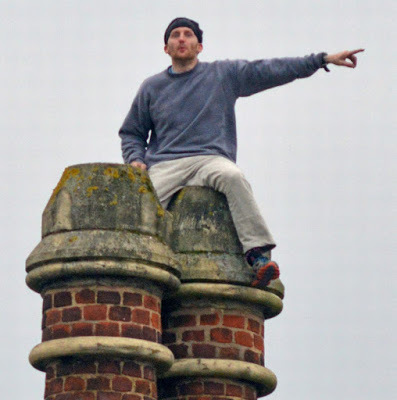 Music blasted from a PA system as a crowd gathered outside HMP Manchester – the official name of the prison- with Horner seen dancing on the roof. However he gave up at 3am on Wednesday morning, telling the Manchester Evening News he was coming down after being promised a ‘pizza and a can of coke’. Horner was arrested and handcuffed as he descended from the roof, with his arms raised aloft in celebration. Seconds before he finally finished his protest, Horner shouted: “I’ve proved my point. I’ve got a 12 inch pizza and a can of coke. African and Commonwealth 100 and 200 metres champion, Blessing Okagbare has been banned by the National Sports Commission (NSC), from the Rio 2016 Olympic Games. Guardian reports that her ban is as result of her refusal to run for Nigeria in the 200m event at the just concluded IAAF World Championship in Beijing, China, as well as opting out of Team Nigeria at the ongoing All Africa Games in Congo. NSC officials were surprised when she competed in the money spinning Diamond League in Zurich, Switzerland, last Thursday after she claimed injury. Speaking with The Guardian at the weekend, Director General of the NSC, Al Hassan Yakmut, said Okagbare had shown so much disrespect for the nation. 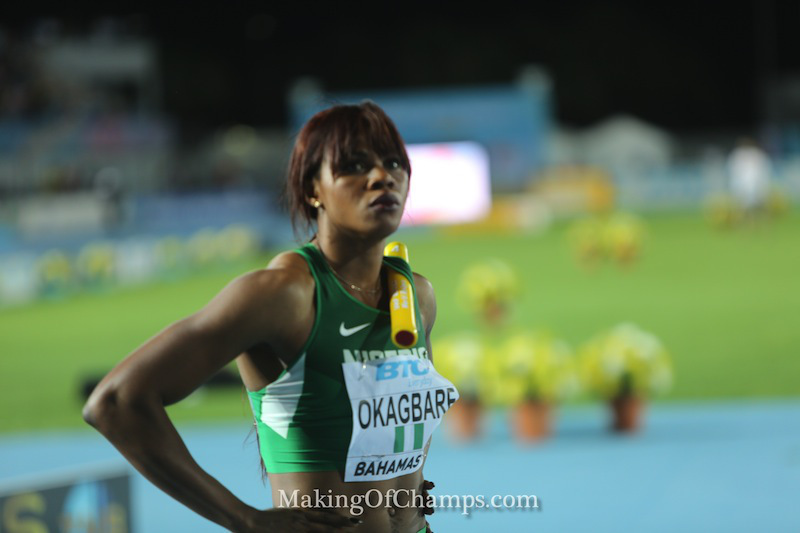 “I was shocked when I saw Okagbare competing in the Diamond League in Zurich last Thursday,” Yakmut said. “I was wondering if it was the same Okagbare who refused to compete for Nigeria in the 200m event at the IAAF World Championship in Beijing, China. She even opted out of Team Nigeria for the All Africa Games in Congo. Why? “I have said it times without number that any athlete who feels too big to compete for Nigeria in the All Africa Games should not bother about the Rio 2016 Olympic Games. No athlete is bigger than Nigeria. I played volleyball for this country, so there is nothing an athlete will tell me about sports. “Tell me what countries like Zimbabwe, Kenya, Uganda and South Africa is doing for their athletes that Nigeria is not doing? If there is a problem, we should sit down to iron it out, instead of rubbishing our country before the international community. We have to take a stand to save our nation from athletes who feel they are untouchable,” an angry Yakmut said. It would be recalled that Okagbare, who was Team Nigeria’s medal hope at the IAAF Championship in Beijing, finished last in the 100m final, and also failed to show up for the 200m event four days later. She raced in last Thursday’s Diamond League in Zurich, clocking 10.98 seconds to finish second behind Jamaica’s Fraser-Pryce, who ran 10.93 seconds. Pregnant Kim Kardashian West glowing.